If you’re motivated by a group challenge, none are as rewarding as the Workout Anywhere 12 Week Challenge. Not only is this challenge the hottest in Spokane, Northwest and beyond, but it’s open to all-fitness levels living anywhere. Thanks to Coach Jessica and Justin Rundle’s Workout Anywhere training, members can stream the best equipment free workout videos and online training virtually. Read on to discover how to burn calories daily and get the physique of your dreams right from home or a hotel room. Our first 12 Week Challenge Results Rocked! 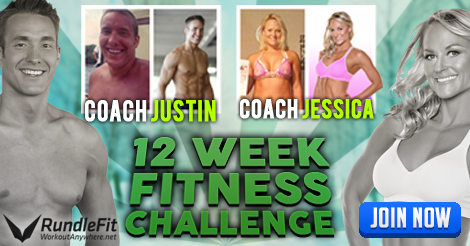 Our 12 Week Challenge has been an annual event for the past couple of years. However, 2015 was better than ever and literally half of our challengers either met or surpassed their goals (see our challenge results here…). Known as the Workout Anywhere New Year, New You challenge, challengers of all ages and ability levels took on our bodyweight trainer or minimal equipment trainer to refocus and reshape their lives. Not only did challengers create happier and healthier lifestyles, they had the opportunity to win big cash prizes. To learn more about what the challenge entailed, visit the official challenge page below. If you’re interested in participating in the next challenge, feel free to comment below or contact us. New Year, New You Challenge Complete! Spokane’s Fitness Scene Forever Changed by Working Out Anywhere!